Visit the published coordinates to view the village sign and checkout the plaque on the post. HAIL-WESTON, a parish in the hundred of Toseland, county Huntingdon, 2 mules north-west of St. Neot's, its post town, and the same distance south-east of Kimbolton. The village, which is small, is situated near the river Ouse, and there are several mineral springs in the parish. The soil is clay and gravel. The living is a vicarage united with the vicarage of Southoe, in the diocese of Ely. The church, dedicated to St. Nicholas, is a small plain structure, with an old wooden building at the west end, containing three bells. The Particular Baptists have a chapel. The tithes have been commuted for a rent-charge. Richard Reynolds, Esq., is lord of the manor. Hail Weston is a Cambridgeshire village a few miles north west of St Neots. The B645 road passes by the southern edge of the village, linking it with Eaton Socon and the A1 trunk road to the east and Kimbolton to the west. Other nearby settlements include the villages of Little Paxton, Great Staughton, Little Staughton, Perry, and Southoe. 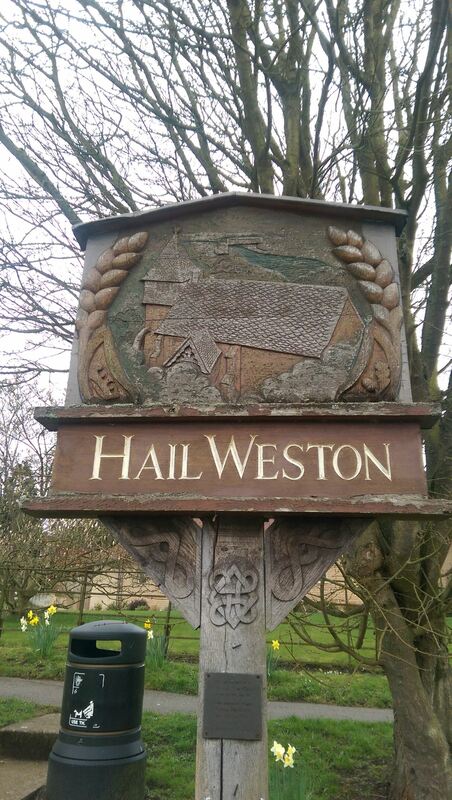 Hail Weston is within the District of Huntingdonshire. The B645 was downgraded from the A45 when the new A14 A1-M1 link road was opened to traffic in the mid-1990s. The River Kym or Hail passes just to the north of the village and is forded by the minor road from Hail Weston to the A1 trunk road and Little Paxton. In the 19th century, the village had three public houses: only one remains of the three.